Yep, this is THE Amazing Vegan Cheese Sauce everyone has raved about. A simple but Creamy, Fat-Free, Vegan Cheese Sauce, made without any nuts, tofu, or dairy. Remember how silky smooth that box of Velveeta got after you melted it? Yeah – it’s like that…..only this isn’t really ‘cheese’. In fact, there’s no dairy in this at all. And there’s no tofu or cashews either, so it’s completely fat-free and McDougall friendly. But when I tell you what the secret ingredient is, you’ll completely flip. Carrots & Potatoes. I know, right? Here’s the back story on how I discovered this delicious Vegan treat…. Because I used to work the night shift, sleeping any kind of normal hours on my days off was out of the question. So as I was lying in bed late one night, watching a Vegan cooking show of all things, I saw this guy by the name of Chef Mark Anthony…..and he was making a cheese sauce. 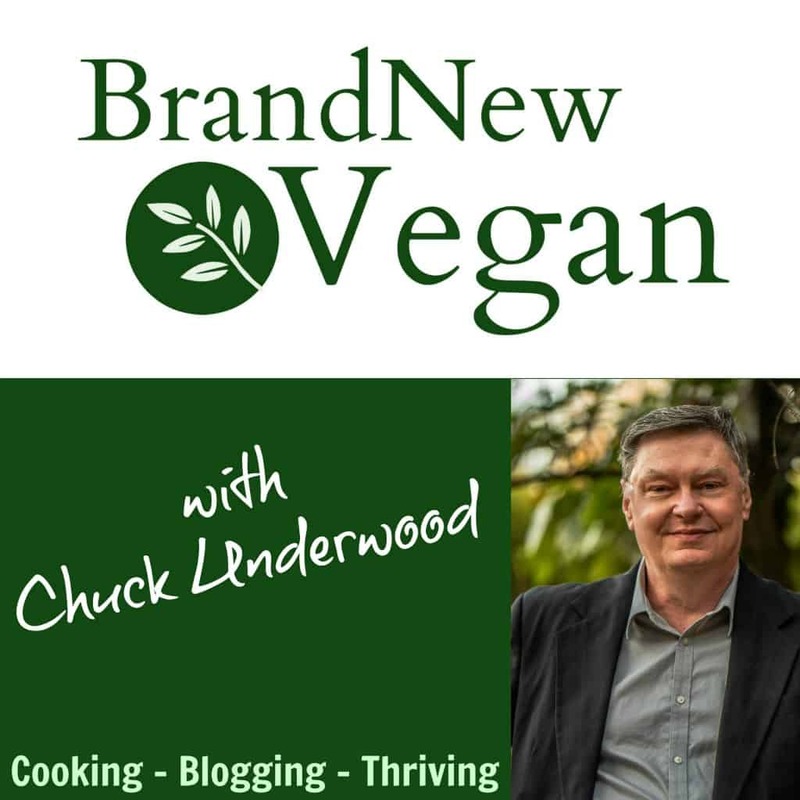 Now most Vegan Cheese Sauce recipes I had tried so far were made from Tofu or Cashews, which are ok…..and sometimes good…. but not everyone likes Tofu, and a lot of people stay away from nuts due to their allergies or the fact they add a ton of fat. So…. when THIS guy starts making a vegan cheese sauce, with Carrots and Potatoes of all things, I woke up pretty quickly. Needless to say I took mental notes and that next day, in my blender…….. I made magic happen. And let me tell you it is by far, the creamiest vegan cheese sauce I have ever had. Kudos to Chef Mark Anthony. Dude….seriously, thousands of Vegans are now thanking you. 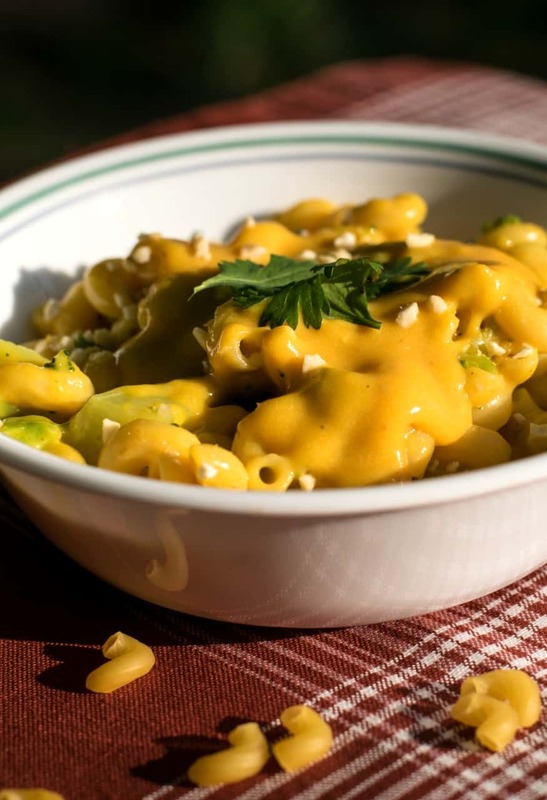 This Amazing Vegan Cheese Sauce was inspired and adapted from his amazing idea. I actually weighed out 3 Yukon Gold potatoes to about 16oz, or 1 lb. After cutting off any eyes I cut these into small chunks and added them to a pot of cold water. I then cut 2 carrots in half and added them to the water. Bring your veggies to a boil and set your timer for 10 minutes. After the timer goes off, turn off the heat and let the pot cool off for about 5 minutes or so. I wanted the carrots to become as soft as possible for the blending process. You can ALSO use your Instant Pot! Just add your potatoes, carrots, and 1 full cup of water to your Instant Pot, and set it for MANUAL and 12 minutes. Allow it to naturally release for 10 minutes and that’s it. With a slotted spoon, transfer the veggies to your blender and add about ½ cup of the hot potato water. Pulse until it starts to become smooth, and then add the rest of the ingredients. Blend on high until it becomes as smooth and creamy as you want. You can add more of the potato water to thin it out if you want, but about ½ cup was just right for me. Now go ahead and get a spoon or something. Well? Just like I said, right? Let me tell you, this is by far the creamiest, the cheesiest, the most Amazing Vegan Cheese Sauce ever! No tofu, no cashews. It will really blow your mind! INSTANT POT: Simply add them to your Instant Pot with 1 cup of water. Set to MANUAL and cook for 12 minutes. Allow to naturally release for 10 minutes before opening lid. I keep seeing this recipe and have been wanting to try it. I was hesitant because the recipes I’ve seen have used a Vitamix. But it looks like you successfully use a regular blender. I’m definitely going to give it a whirl (pun intended) now. Plus, now I can make your amazing-looking biscuits! As a new vegan whose all-time favourite dish is cauliflower cheese, I had been really looking forward to trying this sauce. But I’m sorry: it doesn’t taste remotely cheesy. It tastes like what it is: thin mashed potato with carrot, with some added (uncooked) onion and garlic. I actually found it rather unpleasant. Sorry to be so negative in my first comment on this site, but honestly: there have to be better solutions to the vegan cheese sauce problem than this. Sorry you didn’t like it. I guess everyone has different tastes. And you are right – this is not cheese, but this is something that in my opinion comes close to both the taste and texture of a good cheese sauce. I do know that over time your tastes change, so if you still have a memory of how ‘real’ cheese taste – I can see where this might disappoint. But the longer you stay away from the real stuff – and that memory of how it is ‘supposed’ to taste fades, this becomes a good substitute. My family likes it, and as you can see in the comments, so do a lot of other people. Good luck. It takes a while for your taste buds to change. When cheese is a recent memory, nothing but cheese will taste cheesy! I am surprised how as time goes on, my brain accepts alternative “cheese” sauces as the real deal. One of my favs is potatoes/carrots with roasted red pepper and a small amount of soaked cashews (plus the other basics), and cauliflower Alfredo. I was talking to new vegan friends about remembering taste. I think that if we gave up naming our new vegan dishes the same as the old fatty stuff we’d be better off. I had made ‘cheddar cheese and we all agreed that it was delicious on crackers and french bread. It was very reminiscent of ‘real’ cheese but maybe, just maybe, even better. We also agreed that naming it cheese plants an expectation in the mind that isn’t met. Love it!! This sauce is yummy, creamy, I think it’s cheesy, idk… . I don’t remember what cheese really tastes like & I don’t care if it tases like cheese. THANK YOU BRAND NEW VEGAN!!! Question – can we freeze it? Thanks again for enriching our plant based lives!!!! I am relatively new to this lifestyle but have often thought the same thing. I feel like it is beneficial to use some of these foods that are similar to the ones we are familiar with to win over our children but otherwise, I prefer to have new and exciting plant based meals that my mind isn’t trying to compare to my less healthy diet. I agree… maybe it’s because I’m just starting the program, but it tasted like sour milk. Is there anything I could add at this point to make it less astringent to my taste buds? Pat, I would lower the lemon juice and maybe skip the vinegar. I make “cheese” sauces often and never use vinegar. I have a recipe similar to this but it doesn’t include the vinegar or turmeric. Just potatoes, carrots, water, olive oil, garlic powder, onion powder, salt, lemon, and nutritional yeast. And it’s amazing!!!! I’m the biggest cheese lover and I recently went vegan and it blew me away how good it is!!! Perhaps this person COULD add soaked cashews to give it more flavour and body. I probably would as I don’t have nut allergies. Thanks for the recipe! I made this recipe a year ago when I first became a vegan and didn’t like it and as you said, your tastes change and I just made it tonight and it’s absolutely wonderful. I think as a new vegan, you want everything to taste exactly like the substituted item and I had to get over that mindset and enjoy these recipes for what they are; a wonderful sauce to put over vegetables or in a vegetable lasagna or in macaroni. We love it!!!! It tastes cheesy to us and I’ve used it on lots of things. Thank you for working so hard to create these wonderful vegan recipes! Your answer was a good one! I enjoyed this sauce from the beginning and it tastes better all the time. Thank you Chuck for all the work and time that you put into your recipes for us. I truly appreciate what you do! Did you add the nutriional yeast? That is what really makes it cheesy tasting. or 3. A mixture of a small amount of white wine plus veg stock plus vegan cream plus a modest amount of nutritional yeast. You’re right that the nutritional yeast adds a cheesy flavour, but I don’t like it in large quantities – I find it has an unpleasant aftertaste. So this 3rd variant is more of a creamy sauce with a slight cheesy flavour: not in any way a like-for-like substitute for the gorgeous cheese sauce of my pre-vegan days, but tasty and satisfying for all that. You may just be extremely picky. The gloopy potatoes could have ruined the texture. I know some people have a hard time cooking potatoes without making glue. Did she use Yukon Gold or Russets? Russets tend more to turn to glue. I know, because I’ve ruined many a mashed potato dish. Oops … delete that comment / question please!! Try Daiya cheese sauce! It is so good on pasta and veggies! I haven’t tried it so I’m arguing weather tastes good, it may be delicious. But it is far from healthy, while this one is actually pretty good for you. And this is a lot cheaper. Daiya cheese sauce is mostly oil. That’s why it tastes “good”. It’s not compatible with healthy eating. No, that would be for the “Brand New, Unhealthy, Vegan! ALTHOUGH DAIYA LOOKS AND SMELLS LIKE THE ANIMAL PRODUCT, CHECK OUT THE INGREDIENTS LIST. THIS IS MOST DEFINITELY NOT A HEALTHY FOOD. THE ORIGINAL COMPANY, DAIYA, WAS RECENTLY SOLD TO A JAPANESE NUTRACEUTICAL COMPANY. Yuck. Daiya is just plan nasty. This recipe is great as is!! I was vegan for several months (and had been pretty much dairy free for several months prior to that) before I even bought my first container of nutritional yeast (which is what adds the ‘cheesy’ taste to most vegan cheese sauces). I tried a potato/carrot based recipe for the very first one (similar to this one) and didn’t care for it. I tried a few more variations and it still was just OK. Having been vegan for over a year now I have experimented with lots of variations of vegan cheese recipes. Cashew based ones are very good and very rich but also high in fat and calories. I found that if I put salsa in the mix I really liked the flavor and I gradually started subbing white beans for most or even all of the cashews to lower the calories. Adding in mustard and vinegars can add tang and flavor. You really just have to play around but as others have said don’t expect it to taste like “real cheese” and it’s much better to give your taste buds time to ‘forget’ that taste before trying a vegan cheese. If you are doing a program that does not allow nuts/seeds or beans a potato/carrot based sauce like this one is perfect. I’m currently doing potato reset so I’m taking a break from my white beans but that is really my favorite base for a cheese sauce. It is really creamy and goes great with the nooch flavor. Didn’t you put in the nutritional yeast and mustard and the rest of the Ingredients? Mine was full flavour and super creamy- maybe try adjusting your water ratio and add slowly while you are blending. 🙂 good luck with vegan- it’s a breeze! I tried it this morning, and I too was very disappointed, and have to agree with Stephanie. Love this cheese…. i cook some tofurky chorizo and stir it in for an amazing dip. Finally got around to trying this and loved it! I learned long ago to accept these “substitutes” for what they are: a yummy addition to our meals! This is my second time making this recipe. I loved it the first time, even though it had a carrot flavor. This time, not as much carrot instead cheezy goodness! I’m starting out as a vegan, and this is very tasty. Thanks! Chuck: My wife and I tried this amazing cheese sauce with some whole wheat rotini tonight. Honestly couldn’t resist it…so mac and cheesy without all the cheesy badness. Thanks for the great recipe!! I have shared it on my blog today! I just made it for the first time tonight and put the whole thing on a pound of whole wheat shell pasta. I agree, makes good mac and cheese. I weighed out the measurements (carrots on the low end) and I had run out of turmeric, but it was still great! I really like it, my husband will eat it and my kids have to eat it. 😉 My almost two year old gobbled it up, so he’s with me. Thank you! Can this sauce be frozen? It does make a lot. My carnivore husband liked it. We added more salt and hot sauce for mac and cheese. I’m going to put a little on top of stuffed mushrooms tonight. Excellent, and even much better after an overnight rest in the fridge. Just experimented and found adding 3/4 to 1 tsp smoked paprika to whole recipe is a great, optional addition. Ok, I’m seriously addicted to the “cheese” sauce. The first thing I made was a baked potato with steamed broccoli and cheese sauce. Yum-Yum. Some of the leftover went into delicious nachos, sprouted corn tortillas torn into pieces and baked in the oven until crisp, some ff refried black beans, chopped lettuce and tomatoes, salsa and then the sauce over all that. Thank you so much for this recipe, I know I can can do this with the help of this sauce when I’m feeling a little deprived. Thank you! Thank you for this amazing recipe! The texture and colour of this was incredible – exactly like a proper nacho cheese dip. Personally the flavour didn’t work out quite right for me – it was nice, but for my own tastes I added soy sauce and some jalapenos. An alternative I tried for those who don’t mind the fat content being a little higher but still maintaining the awesome texture of your recipe – try adding some softened vegan cream cheese to the mix while blending it up, then sautee some finely chopped onions, garlic, jalapenos and chipotle peppers in a vegan butter alternative and stir these into the mix at the end. Thanks again Chuck, love your recipes! I finally did it! Made Mac & Cheese AND the biscuits!! both keepers… Please tell me the best way to warm the cheese back up-as in leftover mac & cheese- It took forever to soften to the gooey stage when reheated in the non stick skillet with the top on over medium heat- and really glued to the bottom of the pan. Thank you for your awesome recipes. I’m so bummed but I didn’t like it either!!! I ended up adding a little vegan sour cream, more nutritional yeast and taco seasoning. Which brown mustard do you use? Guldens usually. Any brown mustard will do. This is delicious. I’ve been eating this mac & cheese for the past few days. My husband won’t try it. Last night he was in the kitchen making his boxed Kraft Mac & Cheese, and I said why don’t you try mine. He said “no way, I want the real stuff.” I left the kitchen shaking my head. Are you people lacking taste buds? No offense to the author but this tastes like potato and carrot soup and the nutritional flakes give it a bad aftertaste. I’ve been vegan for many years and what I find strange is how everyone tries to make things taste like what we aren’t eating any longer. This doesn’t even resemble cheese in the least. And to the lady who was trying to get her husband to try it, lol, good thing you didn’t. You are certainly welcome to your opinion. No, it’s not cheese and I think we all know that. But it does have a cheese sauce consistency, and it’s made from healthy ingredients, and if you don’t like nooch you certainly don’t have to use it. Yes, we do seem to try to replace the foods we miss – not sure why that is but you’re right. My French Fries, Cheese Sauce, Pizza Dough, Chili, and Tacos are all very poplar recipes. Human nature? Couldn’t tell you. I think it has a lot to do with trying to replace those ‘comfort foods’ we all knew and loved before becoming Vegan. I’m not a fan of the potato/carrot mix for a sauce either, but I certainly will continue to try recipes because I would much rather try something like this than go back to velveeta if I have a hankering for some yellow creamy saucy goody. As a relatively new convert to eating whole food plant based, I am proud to say that no matter my opinion, I truly hope I never become so unpleasant as to attack someone who is trying to better their health or maybe even support the ethical treatment of animals. I think many vegans need to remember that their fellow humans need to be treated nicely as well, especially those who are contributing to the cause. Love so many of your recipes, and I will continue to try them. Please don’t let the disagreeable ones slow you down. Such a pleasant person. This was the most unnecessary, mean spirited message. Lol I don’t think she’s being rude at all, infact I kinda understand how she feels. I haven’t tried this recipe but I’ve tried numerous others on this and other vegan sites and cannot believe how bad some of the dishes are that people rave about. Gets annoying wasting so much ingredients to have an inedible meal at the end of it. So I get where she’s coming from. Debbie – I’ve had a similar experience. I’ve been vegan for several months now and have tried recipes that have excellent reviews only to find I can hardly eat it! I hate the waste. I’ve had the best results from Brand New Vegan recipes so far, so I look forward to trying this one. I’ll try not to expect it to truly taste cheesy, but hopefully it will still make a tasty sauce for veggies and casseroles. If it does taste similar to real cheese sauce – bonus! Ellen Fisher is a good vegan to buy the recipe book from. I’ve tried making this with a blender and would say that if you’re getting a bad result, weighing it is very important and havimg a vitamix is seemingly the second most important. I have to try it again still, last time there was the most odd color without turmeric. I tried a recipe similar to this and thought it was kind of blah. This, however, is amazing. It’s VERY close to cheese sauce (I just had cheese sauce last week, so I’m pretty sure I know how it tastes). I was not expecting much — I used it to drizzle over a casserole, so I didn’t really care if it wasn’t all that great, but I am blown away. I can’t wait to put this on a baked potato. P.S. Taste buds are fine. I can’t speak for anyone else, but my reasoning for trying to duplicate flavors and textures of animal protein foods is for my children who go back and forth to their dad’s, who doesn’t feed them even a vegetarian diet, (kind of a way to turn the knife even though they were always vegan) and especially when I have family over, or entertain, and really want to show them they don’t have to give up their favorite flavors and textures to become vegan. I remember becoming vegan from vegetarian, and having the toughest time giving up cheese. Then later….it didn’t even taste good to me, as I truly began to appreciate the natural flavors and textures of natural and fresh foods. Most people require baby steps though, so I never judge. It seems the more irritable vegans become over peoples food choices, the more we are ridiculed for our healthy ways, and people become less likely to even try vegan options. GinaD, you like some others may have what some call an over sensitive palette. I like you find that nutritional yeast tastes a little bitter or leaves a bitter aftertaste. I could never understand growing up why I did not like the taste of celery, onions, tomatoes, or any other raw vegetable. They all tasted very strong and bitter to me. I could never drink vegetable juice, V8, as it just tasted strong and bitter like ground up vegetables. I love cooked vegetables on the other hand, as that tends to bring out the natural sweetness of the vegetables. While others in my family have no problems eating raw vegetables, my brother can eat a raw onion like an apple. But I would get ill if I ate onion raw,(I can smell raw onion in potato salad from 10 feet!) there is nothing wrong with other people’s taste buds or yours, they are just different and you have to adapt to what you can tolerate and I hope this helps you and others understand not everyone will get the same enthusiastic enjoyment out of every recipe. Thank you so much for this delicious cheese sauce recipe. I’ve been scouring the blogs for a tasty one without success. I’ve even tried one with almost identical ingredients that was awful! I decided to try yours anyway and boy am I glad I did. It is delicious. I did add 1 tsp smoked paprika however and it added a slight smoky, spicy flavor. This is delicious!!! I’ve been enjoying it on pizza, tortilla chips, rice, and sometimes just by the spoonful! The consistency is the most accurate I’ve come by. This tastes a bit like cheddar potato soup but still works well as a cheese sauce substitute 🙂 And it reheats great. I’ll try yours. I make mine from yukons and zucchini. I would imagine that yours is sweeter. I tried this sauce tonight… added 1/2 tsp smoke paprika as others had adviced and it was very very good. Thank you Chuck, this is by far the healthiest cheese sauce I’ve ever tried and it’s very tasty! Hi Chuck, tried your amazing cheese sauce as a plain mac and cheese last night. My wife and I have been eating a most!y vegetarian diet for the past year. Still eating a little cheese and yogurt, but this sauce will become the base for many favorites like Mexican dishes and veggie- laden casseroles. Thanks for sharing this great recipe! I just finished making this sauce for the third time. I swear it tastes better every time. I keep wanting to make your biscuits with the leftover sauce but there never is any lol. Thank you so much for your awesome recipes! I just made this for the second time. The first time, I used Yukon Golds, and it was amazing. I couldn’t get enough of it! The second time, I used Russets, because that’s what I had. I think I used too much potato & carrot, and not enough spices, because it really tastes like nothing. I’m so bummed, because I’ve been craving this sauce since my first batch ran out the other day! Can’t even finish my potato with the new batch of cheese sauce on it. 🙁 I don’t have a kitchen scale– is there any other way to get a more accurate measurement of the potatoes & carrots? I would so appreciate it in cup measurements. Thank you! I just made a half batch and poured it over a 1pound bag of frozen chopped spinach that I had thawed in a pot. Mixed it in and had delicious!!! creamed spinach. Good to see you again John! I have been challenged to make a cheese sauce as well and got so far as a beautiful texture and color using carrot and homemade oatmilk, but I am following a protocol that doesn’t allow certain spices like paprika, pepper, salt, or nutritional yeast. So I end up with carrot sauce. yuck. It’s been 2 years since I’ve had cheese, apparently I have a very good memory! Do you think there is something I could use in place of the yeast? That seems to be the ticket in so many recipes. I can live without the other spices…. Hi Susan. Have you tried using a 1/2 cup of raw cashews (soak the cashews in hot water for a half hour – drain out the water and then put in the blender with the other ingredients that you are allowed) – if you’re allowed garlic, put 1-2 cloves of freshly pressed garlic into the blender. The cashews give a creamy consistency. It will taste a bit more like Alfredo sauce, but still delicious on pasta. Yes I have, but I’m hesitant to add that to my recipe since it does add a good amount of fat. Many of my readers follow the low-fat guidelines of Dr McDougall and Dr Esselstyn. I have just made the cheese sauce but the recipe says quarter cup then 2 tbs nutritional yeast is that a quarter cup of nutritional yeast or water? It is a quarter cup of nutritional yeast and two additional tbsp of nutritional yeast. 1/4 cup + 2 Tbsp. “Amazing” is an understatement! Made this with a can of Rotel tomatoes and the spices from your sweet potato nacho cheese recipe +1/2 t cumin and some sriracha for heat. COULD NOT STOP EATING IT! So much better than the roux-based cheese sauce. It makes a big batch, which is fine because it warms up well. Thank you! You are Amazing, love all the recipes I’ve tried so far… This is Fantastic Cheese Sauce… Picky hubby even liked it. Took it to work for a Baked Potato. My coworkers are always curious about what I’m eating. They were asking why I was eating Cheese sauce, since being Vegan. When I gave them a taste, they couldn’t believe how delicious the sauce was, and the ingredients….. they all wanted the recipe. OHMYGOD. Going to try this during the week!! Do you know how long this might keep in the fridge? Probably a few days, I’d guess. It doesn’t last long in ours as it disappears pretty quick. A few days….yes for sure. A week? Maybe??? I make this and add 1 can of diced tomatoes and green chilis. Takes it to a whole new level! Amazing recipe!! Thanks Chuck!!! I made this today and it’s so yummy! I will be making it again soon. I did make a few adjustments based on what I had in my pantry and on others’ comments. I chopped up and boiled a small onion with my carrots and potatoes. I also used some dehidrated garlic flakes in my boiling water. I omitted the powdered garlic and onion. I didn’t have turmeric so I used smoked paprika. I also used Dijon mustard and put a little more in because I like the mustard flavor. I love the texture and I can see more opportunities to adjust the spices to my tastes. Made this. Love this. I plan on using this for many things, such as nacho cheese sauce, rotel and cheese dip, the base for broccoli cheese soup, squash casserole, Mexican corn bread, and more as it occurs to me. I’m only 4 weeks into plant based eating/cooking so I’ve found myself on your blog many times over. You use flavor! Love it! Thank you! I love this sauce, but did make a few changes, due to diet. I don’t do well with too much starch so I boiled the carrots separately from the potatoes and used carrot water instead. I don’t use salt so I added just a touch more lemon juice. I’m sorry, I do not like apple cider vinegar so I used white wine vinegar. It came out great. Love your website, love the recipes. Nope, I’ve made two versions of this exact recipe, and they’re both like putting garlicy mashed potatoes on pasta. Not in any way, shape or form like eating cheese. I’m guessing it’s good enough for vegans to have something that resembles what they’re trying to eat, but this is in no way like a cheese sauce. It’s disturbing to eat what is basically garlicy whipped potatoes on noodles. I’ve just started into veganism last month, but there’s nothing wrong with my taste buds. This isn’t to attack his recipe, because absolutely everyone else is posting the same thing and getting people to pretend it’s great. Adding nutritional yeast didn’t make it any more like cheese than the first batch I made. Maybe if someone thinks the people stating the truth about this are rude, it’s because they can’t break away from their delusions. It tastes like what it is. Mushed up potatoes with too much garlic in it. It is not at all like cheese. Nobody else’s potato based recipe for cheese sauce is like cheese, either. Wanting it to be so, because it looks smooth and orange is just living under an illusion. Whine more, I dare you. This month marks my 49th year thriving on a plant based diet. The food I choose to eat needs to taste good, that’s all. I do not try to “mimic” meat or dairy. I drink rice and cashew milk because it is delicious, not because it mimics cows milk. I’ve made sauces similar to this one, many, many times, and I love it poured over pasta, rice or vegetables, or mix in some fresh salsa and dip corn chips in it. Again, I love it because it is good food, NOT because I’m trying to fool myself into thinking I am eating dairy cheese. I love carob, not as a replacement for chocolate- which I love as well- but simply because it is delicious. Good for you. Some of us also have food allergies, and miss certain foods. Stacey – The recipes at this site fit the parameters of No Oil, Whole Food, Plant-Based eating. This is not the same as being vegan. Vegans can eat very high-fat foods and have the same level of heart disease as people who eat animal products if they do persist in eating processed, high-fat items in large quantities. It takes approximately 90 days of eating no oil and no high-fat items for the brain to re-wire and clear-out the addiction to high-fat. You might want to look at the YouTube video lectures of Dr. Neal Barnard to help you understand what is happening in your body. Good luck with the journey! You’ll find when you come out at the other end, the food tastes great. I think you need more liquid. Mine was like mashed potato, water helped. I agree it doesn’t taste like cheese sauce but I enjoyed it for what it was. I’m going to give you the benefit of assuming you’re not actually a troll, and ask: Are you perhaps not using a high-powered blender? I don’t think the results would be as creamy in a food processor, for example. Also if you don’t like the flavor of strong seasonings, maybe kick the onion and garlic back to a 1/4 tsp? Though you may not need to if your blender incorporates it more evenly and you use enough starch-water. Love, love, LOVE this dauce! You’ve done it again!! Yum! Both of my kuds devoured this -we put it on elbow pasta for macaroni and cheese. It’s the consistency and tang of those ‘ready-to-eat’ packets where you squeeze processed goop onto nuked pasta. Can’t thank you enough for a great, quick, nutritious, and TASTY addition to our dinner line-up! Thank you for this and your other recipes! Made this today and it turned out great. I split the end result into two 16 oz. mason jars. In one of them, I left it as-is and labeled it cheese sauce. In the other, I added a few tablespoons roasted green chiles, 1-2 tsp. New Mexico chile powder, a dash of red bell pepper powder, a dash of jalapeño pepper powder, and a bit of freshly ground pepper and labeled it queso. Make sure you use Yukon Gold potatoes or a similar waxy potato otherwise the result could be unpleasantly paste-like. I just made this (minus brown mustard and onion powder, which didn’t have) and really enjoy it!!! I agree with some that it tastes nothing like cheese sauce, but I like it for what it is. And it’s certainly filling and healthy! Just made this tonight. It’s my first recipe by Chuck, and I loved it. I did have to add more water than the half cup to get a great consistency, but other than that, I loved it. My boyfriend tasted it and thought it was pretty good. He’s been struggling with being vegan, but refuses to give up. He’s a tough customer, so it was wonderful he finally liked something!!! I’m looking forward to trying more recipes. Thank you, Chuck!!!! Is there anything I can substitute for the nutritional yeast? I made this, and added extra nutritional yeast, lemon juice and spices. After the modifications, it tasted remarkably like cheese sauce. My husband who isn’t vegan says it’s his favorite cheese sauce he’s ever had. This really was a lifesaver. I was so sick of the fake cheeses and didn’t like the cashew ones. Thanks so much! I tried this but it turned out with a slimy consistency. Any thoughts? No idea……that’s the first time anybody’s had that problem. do you think this would work with cauliflower instead potatoes to lower the carbs? Don’t know…..I’m not a low-carber and I’ve never made it that way. Try it and see. Made this earlier today, think I used a bit too much carrot ’cause it has a carroty flavor and is more orange than yellow. Will cut back on the carrots next time, maybe add a bit more nutritional yeast and a touch less lemon juice… Maybe a bit of smoked paprika as well. Finally made your cheese sauce, Chuck. I too, think I will cut back just a bit on the lemon juice next time. Also, I added a couple of TB more of the nutritional yeast. It’s very good. I’m serving it tonight over baked potatoes and broccoli/cauliflower. Thanks for the great recipe! What could you substitute for carrots? Are they only for color? What would happen if you left it out? You could try a small amount of sweet potato instead. I just made this sauce. OMG….it’s AMAZING. I did add an extra TBS of nutirtional yeast though only because I like it extra cheesy. Nothing wrong with the recipe as my twin made this last week and made it according to the recipe. Thanks so much for this recipe. Definitely a keeper! This is the best of the “cheesy” sauces I’ve tried. Most of them are not even very good as sauces, let alone cheesy substitutes. This one is good AND is very cheesy to me. My guess is that the denigrators are either so new at veganism that their taste buds have not adjusted, yet, or they do not really taste the sauce for what it is. One said it was thin. Mine was NOT thin, so I suspect they added too much liquid. That will not create what I experienced. If someon promotes a healthy food substitute, then the expectation is that it will “be” that food only healthier. I do not like to use “fake” food names, such as “tofu chicken nuggets.” Just call ’em “tofu nuggets.” I get it, but I try to come up with recipe names that are more true to the actual food. “Cheesy” is better than “cheese.” There is still an expectation, but you’ve not set up an impossible bar to reach. Wow! Thank you so much for posting this. I have embraced the plant-based diet and my all time favorite was cheese. That was my weakness. I realized that the thing I am looking for in food is not necessarily the taste, but the consistency of what I ate in the past. This dish provides the consistency. No, it does not taste like “cheese”, however, it does feel like cheese and taste great too. I poured this over some rotini whole wheat noodles and “mac and not cheese” it was! Cheese is orange. How does it taste? I probably missed this somewhere but are the potatoes peeled or unpeeled? Thank you!. I made it once before and it was perfect and couldn’t stop eating it. Second time it was thick and not the same. For accuracy can you tell us how much weight the carrots should be plus potatoes? I left the skins on (for extra nutrients) and it turned out so good!!! Thanks for the recipe. I have been vegan for over 2 years now and my wife just discovered your blog a couple weeks ago. 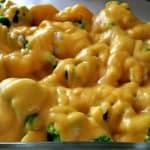 This cheese sauce recipe was the first of your recipes she tried. This sauce is amazing!! Hands down the best vegan cheese sauce! The fact that it is this creamy and delicious and fat free is awesome! Wowsers! What a fantastic recipe. It yields a ton of sauce on the cheap too! Thanks for the dope af recipe! I will say that my first taste left me unimpressed as I had the taste of dairy cheese in my mind and could only taste lemon. I added a little more salt since I never add enough with my grinder plus another heaping tablespoon of nutritional yeast and pepper .and put it over noodles. Yummy and so low calorie. Thank you!! I have been wanting to try this recipe and it turned out great! My husband (non vegan) even commented how good this sauce tasted. I loved it and will be making this again!! Just made this and it’s amazing!! Adding it to a broccoli and cauliflower casserole with gluten free bread crumbs! Thanks! SO curious to try this recipe. Unfortunately, we don’t seem to have brown mustard here in the Netherlands (only the seeds). Could I use yellow mustard or would it ruin it? Use yellow mustard. Should be fine. I am beyond surprised at how delicious this recipe is and that it’s fairly easy to make! Thank you!! Not sure how to add a pix, but I took plenty and was hoping to share. I’m an omnivore looking to incorporate more plants into my diet and think this recipe is delicious. I add a little oil when I’m pureeing because I’m not adjusted to fat free flavor and it makes a world of difference. I’d say the flavor is closer to velveeta than cheese which is also delicious in my book! Thank you for sharing! Okay, I made this the first time about a month ago, and it was okay, though I didn’t find the consistency to be as expected. The second time, i didn’t have any carrots, so i used butternut squash and ended up with something quite flavorless. But making it a third time just the day before yesterday, using powdered mustard instead of prepared…the only substitution I made,,, it turned out delicious! I love the gloopy texture that the blended/pureed/liquified potatoes have. I mean, if there was cheese in it, it would be stretchy and gloopy, right? and I did a sloshed TBSP of lemon juice, not level, but “oops, I sloshed into the blender!” And then blended the everlovin stuffings out of it…and it is really good. The flavor is nice, and the potato protein or something makes it perfectly gloppy, with a very similar texture to cheese sauce that I used to make on the stove top…maybe even a bit smoother. I’ll be making this again. My wife made this to put on mini tacos for me. We’ve had some interesting experiences with cheese substitutes so I wasn’t expecting the perfect taste of cheese dip. I’m excited to cook up some pasta and make Mac and cheez with the leftovers. I have made this sauce several times & had a couple bad experiences which I discovered was due to the types of potatoes I used. Regular plain white potatoes where too starchy & came out gloppy, like when regular mashed potatoes go wrong. When I used russets or Yukon Golds, it turned out great! I usually add a little more water & only have a regular blender, not a Vitamix. – subbing a whole clove of garlic & 1/2 a chopped onion & cooking them with the carrots & potatoes instead of the powders. I make this every couple of weeks for baked mac & cheese at the request of my very picky step-daughters, they love it! Sometimes I will stir in some immitation bacon bits when stirring ithe sauce into the cooked pasta shells. Pour it all into a casserole dish & bake it with bread crumbs & vegan Parm on top. So good! (Tip: don’t over bake or it dries out). Any left over sauce is kept in the fridge in a small mason jar & used like cheesewiz on toast!! Thanks for the recipe, Chuck! I was so excited to read this easy recipe until I started reading the comments, I don’t know whether to try it or not, like other new vegans that share recipes and everyone talks about how delicious it was and mine isn’t edible , I was starting to think I can’t do this vegan cooking , but I am continuing on with it , experimenting more and understanding more , I just might try half this recipe as I have wasted more money on recipes that call for 15 ingriedients , you have a lot of really good comments and I agree with the taste bud syndrome lol I’m starting to enjoy the lack of rich fattening foods I once loved, I’m glad I came on andsaw this , the first REAL post I have seen since becoming vegan, which is a month now .thank you all for helping me understand what I’m going through ! I came across your recipe by accident, didn’t know what Brown mustard was so I added Keens dry mustard. Also I doubled the amount of spices. I cheated and added a teaspoon of margarine to my Mac and Cheese. I liked the taste and will definitely make it again. Am trying to make better choices and want to eat more plant base meals. Thank you for posting this recipe. So delicious! My new favorite vegan cheese sauce. I had it over potatoes, broccoli, and a homemade GF biscuit. So good. I could definitely see adapting it to other recipes too: broccoli cheddar soup, queso dip, etc. I followed the recipe exactly (my last vegan cheese recipe was a disaster, so I wanted to make it right). I nearly added more water, but persevered and it came out just right. And no oil, no nut milk, no sugar. I don’t have anything against the nut milk version I’ve made in the past, but I don’t always have it on hand. And I think this tastes better. Will make it again, but it makes a lot, so we have leftovers. Even better! It doesn’t taste exactly like regular dairy queso from a jar, but it’s hard to replicate that vaguely chemically flavor using real food. ; ) This is fantastic. I am a brand new vegan and this cheese sauce is seriously delicious! My husband even loved it and he’s very picky. It is even better than that cheese dip you buy in a jar, the one with milk that’s supposed to be real, I’ve never liked that, always tasted so artificial, because it is, I know. Anyway this is perfect. We used it on tacos, on noodles as a mac n cheese and dipped your fries in it. Thank you so so much for this and all your recipes. Try Sari foods non-fortified nutritional yeast. No vitamin aftertaste.! It’s great and cheesy tasting. Amazon sells it. I I made a similar recipe shortly after I stopped eating cheese and found it disgusting. People told me to wait and my tastes would change. Made this tonight 6+ months later and OMG this is sooooo good. I put it on noodles and broccoli and I am in cheesy heaven. I am truly amazed with this sauce. Definitely a keeper. Thanks! Having made cashew cheese before, the consistency with potatoes is far superior and cheese-like. Made this recipe for non-vegans at my latest dinner party and everyone devoured it. I have a kitchen aid food processor, not sure a standard blender will do the trick. *Tip: A teaspoon of Vegemite is great for extra kick in any dairy-free cheese sauce. There is nothing amazing about this cheese sauce. I used it to make mac n cheese and it was the first meal in 18 months of making vegan food that my omni partner said “That wasn’t very good!” And I had to agree. This is not a substitute for cheese sauce, Don’t waste people’s time or ingredients. Made this for the first time last night. It’s a delicious sauce! Can’t say it’s very cheese like, but it’s really tasty and creamy. I sautéed mushrooms and zucchini and mixed those with pasta and the sauce….ate it all very happily!! Try it!! Chuck – I’m sorry people can be so rude when stating their dislike for this recipe. I love it and it satisfies my need for a cheese sauce on pasta and vegetables. Is it the same as Velveeta? Of course not but it’s tasty and creamy! I think people need to be aware to use the Yukon gold potatoes as other potatoes won’t create the same creaminess. I add extra garlic and onion. To make it pack a punch. Do you have the nutritional information for this? I’m using a diet app and need to input the macro nutrients. THANKS! I made it exactly like the recipe and it doesn’t look anything like the pictures and it doesn’t taste anywhere close to cheese. It looks and tastes more like hummus. It does taste pretty good though and I might make it in the future again to dip veggies in, but I’m disappointed. I’ve had plenty of vegan cheeses and this one doesn’t resemble cheese or taste like cheese at all. You say two to three large carrots. I buy these organic carrots and they’re small. Can you maybe tell me a weight that I could measure so that I know how many I need to make up how much would be required for the recipe? Thank you, I’m looking forward to trying it. This will be my first non dairy cheese. Use the 2 small carrots it will be fine. They’re there for color mostly. Thank you, so delicious and creamy!! This sauce makes me SO happy! Everyone has their own taste, but I believe this sauce lives up to it’s name. The texture is divine. So creamy! As long as I peel the potatoes, otherwise I can still feel them after being well blended. I don’t keep brown mustard in the house. So, I have been using dry. I’ve also added a 1/4 teaspoon of plant based lactic acid (I have on hand for other vegan cheese applications). It adds a nice tang. Each time I make a batch, I get more creative with it’s uses. Tacos, nachos, veggie dip, tater tots, queso dip. And of course, the creamiest mac and cheese! Next time, enchiladas! Thanks Chuck! Best cheese sauce recipe I have ever made. Thank you so much for posting it. My wife and I have been wfpb for about 5 months or so, and I can honestly say that we can’t live without this cheese sauce. Thanks Chuck for this brilliant recipe and for all you do. Just made this as specified with yukon gold potatoes. I made a small portion because I made a disastrous cheese sauce before that I didn’t like as much (pumpkin based and potato/carrots based). I roughly weighed out the portions of potato and carrots in my hand and I omitted the vinegar as I didn’t want it too tart. Turned out great, I would use slightly less lemon juice next time but that’s just personal preference. Having it right now on gluten free macaroni for a mac ‘n cheese that I actually like this time. I think the big difference between last time when I made this was I used yellow mustard (not brown) and I used russet potatoes which didn’t cream up and goo up like these did. Totally different. This sauce is awesome! I used it to make a cheesy potato casserole. In an 8×8″ baking dish, mixed cheese sauce into a bag of frozen southern style hash brown potatoes (partially thawed). Baked in my toaster oven at 375 degrees for 50 minutes or so. My omni husband just said, “this tastes like real cheese!” One other note, I made this super easy by using canned potatoes and carrots! THOSE WHO END UP WITH BAD TEXTURE, PLEASE READ THIS! IT’S A BLENDING ISSUE AND THIS COULD MAKE OR BREAK THE RECIPE! I never post on blogs. I read them constantly, been veg for almost 20 years and alter recipes 90% of the time to make them vegan (was strict vegan for 3 yrs), and I also cook for meat-eaters regularly. So, I scour the web and experiment non-stop and I can say that this sauce has the best the consistency of anything I have made, but it is absolutely dependent on “over-mixing” the starches to bring out the key element that transforms these from potatoes to something else entirely. If you have ever over-mixed anything starchy or over-beat a cake dough, you understand that you get some crazy textures going and that the flavors are consequently affected, as well. I grew up learning to mash potatoes and cake batter by hand because a mixer could well turn them to what many call “glue.” You’re developing the starchy proteins too much for the original chemical bonds to maintain their integrity. But in the case of this sauce, we WANT that! We transform the FLAVOR and TEXTURE of the potato into something totally different. Yes, the flavor changes too! I made this tonight to see if i could turn out a vegan alfredo sauce, so i skipped the carrots due to their sweetness and color and added my own flavor elements. I need to make some tweaks, but the key to success for a good cheese sub (for me anyway) is more about texture than flavor, as flavor is easy to fix (brown and caramelize some red onions for smokey “bacon”, drizzle in some mushroom stock or truffle oil to develop a deeper savory nuttiness, sautee some spinach and garlic for tangy kick, etc, etc). Long story short: this sauce I made tonight, based on the recipe.here looks and can easily pass for a killer legit dairy-based alfredo. And its incredibly easy and versatile. I feel like I finally found the vegan holy grail (aquafaba has got nothin on this). I stuck my potato-fredo base in the fridge and I plan to work more with it tomorrow, when I have time to play around and maybe see how it works inside a traditonal vegan “cream” sauce with a roux starter. My goal is to make food that other people love. My own palate is pretty easy-to-please, so i try to think like a carnivore when I decide to go all in on a vegan recipe, and I won’t ask people to try my veganized food unless it’s amazing.. This recipe should be a staple in everyone’s repertoire– vegan, veg, or straight up rare steak eaters. Please, for new vegans or those disappointed with your effort on this or any other recipe, remember that good vegan cooking is all about getting the consistency right, and for this bad-boy, you gotta blend the heck out of the potato/carrot! Take it past the point of prudence. Also please have fun with experimentation. Make up your own recipes based on what you know tastes good and read up on how the basics of cooking work. We need an Alton Brown for vegans, seriously! I love this stuff! I was a total cheese lover before, I am now making my second batch. It absolutely satisfies my craving for cheese! I have been eating it on bread, over lentil noodles, and sometimes all by itself. Thanks so much for this low cost alternative to cashew-based cheese. I love this sauce. It is so easy and tasty! Used a Ninja blender. I was out of lemon juice and used balsamic. Not recommended! Tastes good, but has an odd color. Used this batch to make french bread pizza. It’s easier than take out: slice french bread lengthwise, slather with pizza or pasta sauce, add amazing vegan cheese and toppings. Bake at 350 till toasty. After reading the previous replies about how new vegans may not enjoy the taste, I was hesitant to try this (only been vegan about 2 months). But I’m so glad I did!!! I added this to some whole wheat macaroni and gave it to my family and neighbors. They all really enjoyed it and couldn’t believe it was made from potatoes and carrots. The only things I changed from the original recipe were adding a little more nutritional yeast and brown mustard. I also used my Vitamix and let it blend until it started getting warm. My husband thought it tasted more like a stroganoff than mac n cheese, but either way it was delicious! I am not vegan, but my sister needs to eat dairy-free and low-fat due to dietary restrictions. She found this recipe and decided to make it – holy COW. 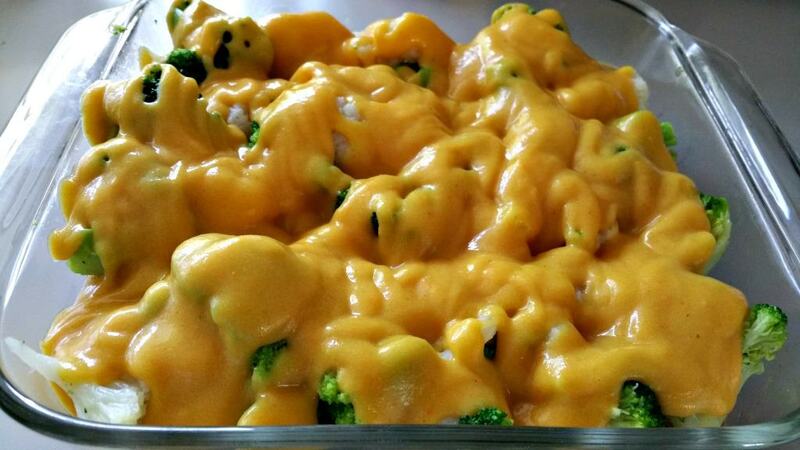 Of all of the “substitute” cheese recipes she’s found, this one is absolutely delicious! We made it as a mac and cheese, and also used it to cover enchiladas with a little bit of Mexican spice in it. There’s no way I would have thought this wasn’t a Velveeta dip, and that’s coming from a non-vegan. Thank you so much for posting this recipe and for helping her not feel so deprived. I was out of oats that I use for my regular vegan cheese sauce recipe and I was craving cheese sauce and tortilla chips. I love all of Chuck’s recipes that I have tried so I thought I would give this cheese sauce recipe a try. I did add roasted red peppers because the recipe that I normally use has that in it and I thought that I might miss it if I didn’t include it. I could really taste the mustard at first and I’m not used to that but it grew on me and I devoured a serving of it in no time. I plan on serving it tonight over macaroni for my vegan husband for his dinner. Thanks for the very easy and delicious recipe Chuck! Thanks, Chuck. I made this sauce this morning and it came out just as you describe and it is SO delicious.. I had to put a lid on it so I would stop eating.. Yum! Brought my blendtec to its knees! I didn’t think this was possible. I added an extra cup of water and it still quit on overtemperature. My (not Yikon gold) potatoes were gummy – I assume this was the problem. The sauce is tasty and a nice flavor addition to potatoes for a Mary’s mini. Thanks for sharing! I really like your blog and your attitude toward embracing a vegan diet. I’ve been whole food plant based for almost 10 months and loved cheeses maybe even more than meat before the change. I threw out a lot of recipes and in desperation tried this one months ago, being somewhat skeptical of potatoes and carrots as a base for a cheese sauce. I LOVE this sauce and make it almost every week! The only change I’ve made is to add a tablespoon of white wine vinegar to a doubled recipe.. One of my favorite ways to use it is over steamed cauliflower or broccoli or over a backed potato and broccoli. I’ve added some salsa to it to make a great queso sauce to put over veggies or for dipping. I’m going to try thinning it with some almond milk to make broccoli cheddar soup. Life would be more boring without this wonderful cheese sauce!! Thank you SO much!! I had rainbow carrots and used two orange and one purple. May I suggest you don’t use anything purple? My cheese came out a lovely peach. Lol. I’m going to try this, but am waiting for my order of unfortified nutritional yeast to arrive. Nutritional yeast is one of those things that tastes good the first few seconds and then, boom, to my taste buds, it gets nasty. I’ve been told the unfortified has a better flavor and is still packed with nutrients. Absolutely wonderful!!! Thank you for this recipe, glad I found it. For me, JUST AMAZING. I wonder if some people who didn’t like it missed a step or two, because this was as satisfying as any fatty, oily cheese sauce for me. HOORAY!!! I tried this great recipe two days ago and immediately poured it on gluten free pasta. Wow a nostalgic moment of comfort food followed. I put it in the frig for a couple of day and when I took it out it had solidified. Is there a secret for reheating to create the original creaminess. It was actually like a gel when I used it in my biscuits. Is this what is supposed to transpire? I also used gluten free flour in my biscuits and they turned out quite hard, however still tasty. By covering with a damp paper towel and microwaving for 30 seconds they were the best gluten free biscuits I have had in 2 years. Thank you for all of your hard work.Chuck. Every recipe can be tweaked to suit personal tastes and in this case the particular way you intend to use this sauce. I have seen some recipes that leave out the nooch and use miso and dried/fresh mustard. As other people have commented, it can also be nice with cannalini beans. I will be trying this recipe tonight and I am sure if it is not exactly right for my dish, I will taste it and add what is needed. I don’t understand why people would feel they have wasted ingredients. Simply taste and modify before pouring over pasta or other food. Steam chopped potatoes and carrots in steamer for 15 minutes until tender. Test with fork. Transfer to Vitamix without liquid. Add nutritional yeast, sundried tomato, garlic powder, paprika, almond milk, and/or lemon juice. Blend until smooth. Mac & Cheese Sauce with Hummus and Ketchup! Combine all ingredients in a medium saucepan on medium to low heat, stirring constantly — whisk until mixture is smooth. Simmer in saucepan, stirring, until thick Great on pizza or similar foods. smooth and creamy. Use for scalloped potatoes, or on pasta. Problem…. I’ve made this before and it was Amazing… Made it today to take to a Burrito Bar supper at work and It’s not as great for some reason, Disappointing, so not sure if I’ll take it or not… Carrot is kinda the first taste I detect when I tried it… So I’m thinking I had too big of carrots…. So I have a favor to ask of you, Chuck. When you make this recipe the next time, could you weigh your Carrots and enter it on the recipe… Many bloggers are starting to add weights for ingredients to they’re recipes(that aren’t measured in cups/spoons), gives a way more accurate amount. Since people have different ideas of the words… large, medium and small which can make or break a recipe. But if its too much extra work, I’ll try figure it out… Thanks in Advance. After being on a whole food plant-based diet for a year I finally decided to give the vegan cheese recipe with potatoes and carrots a try. I’ve seen it several times and I just thought to myself how could this work LOL. Wow am I blown away, it really does taste like cheese and it will be a new staple in my home. Even my husband who is a carnivore eater and is very critical of my wfpb cooking said he really liked it and that he thought it did taste like cheese. Thanks for the great recipe look forward to trying some more of yours! I made this recipe and made extra to freeze to use later. I wanted to have for biscuits and maybe baked potato another time. I have searched but can’t seem to find if there is a best way to defrost the cheese sauce..
Chuck, This cheese sauce is amazing!